India is a hub of spices and it is acknowledged for its spices wealth. India has a large assortment of spices which are mostly used for medicinal properties also. Like turmeric is herbal medicine used to cure the sore throat, improve digestion, black pepper and asafetida is used to remove stomach irritation, carom seeds is used to remove the gastrointestinal and acidity problems. Not only that, Indian spices spreads magical aroma in the food, which is very rare found in any cuisine. Every spice has its own exotic flavors give a special kick to tongue. Here we will introduce you the Indian spices online, good for betterment of health. 1) The whole seeds of spices are used to season the recipe. They are mainly used in “tadka” of Dal, curry, Punjabi dishes, non-vegan recipes and mostly to add Dum in Biryani. Fenugreek seeds, cumin seed, coriander seeds, nigela seeds, mustard seeds, Cloves, bay leaf, Black Cardamom, carom seeds, Kashmiri red Chili all are the spices which are used whole to season the Indian cuisine. 2) In Indian ground spices is known as “Garam Masala”. Turmeric powder, red chili powder, Jayfal powder, mango powder, asafetida powder, black pepper powder, Cardamom powder, dry ginger powder, dry pomegranate powder is used to add color and taste to the vegetables and dals. 3) The ground paste is also used for thickening dishes. Like water melon seeds, poppy seeds, cashew nuts mixed with garam masala are used to marinate the meats, fishes and paneer. All these are used to make the rich and dense curry of vegetables and non-veg dishes. Big benefit of using spices in Indian recipe is to gain better health and taste. Indian spices just not enhance the taste of dishes but it also helps in fighting disease too. Here are the 5 healthy reasons why Spices are good for health. However Indian spices help in burning far and improve metabolism too. 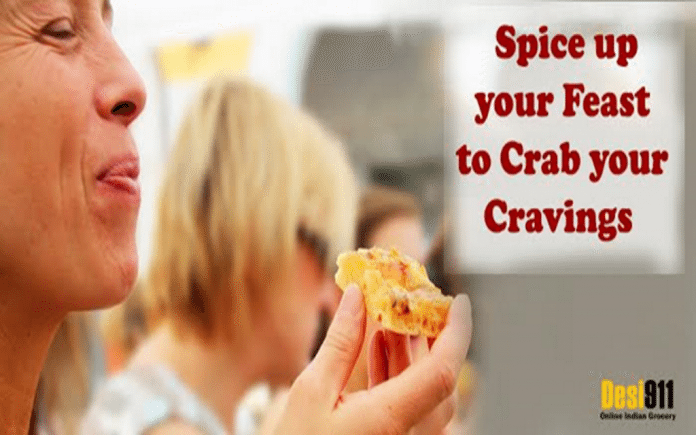 Spicy food includes capsaicin, which is good for health. Capsaicin works as a metabolism booster. Capsaicin is a best agent for reducing the weight. If anyone follows the problem after eating spicy treat can go to the sweet peppers which are little bit sweeter and milder than other hot spices. In Ayurveda spices are known as the best herbal medicine. For example, red chili has a capsaicin which is good for health. It is a good source to get Vitamin “C”. Turmeric is a good source to cure the RTI. Turmeric is also a good agent to boost the immunity. Turmeric given with warm milk is good medicine for treating cough and sore throat problems. Spicy chilies are great for seasoning the Salads without oil and also it is a good cause for providing vitamin A, B6, and E. All these vitamins are good for improving immunity level. It also helps in reducing stress and uplifting the mood. After all it has a special kick and taste, which entertain the person to enjoy the food. Capsaicin is the main ingredient of spice, used to stimulate endorphin secretion in the body. Endorphin hormone is especially known to rejoice the mood. When a person in stress enjoys delicious mouth smacking spicy food it releases endorphin hormone which is responsible to remove the stress. A person can lose fatigue and stress from flavored spices like cinnamon, cardamom, cloves, black pepper and many other luscious spices. Here is good news for the hot and spicy food lovers. Spice works as a good agent to reduce the cholesterol and heart attack chances. Some spices like black pepper, cloves, fenugreek seeds, red chili invites good cholesterol in the body and remove bad cholesterol from the body. When there is a spice there are multiple benefits added with it. The fifth and most important advantage of adding spices in the recipes is to improve the metabolism and remove the indigestion problems. Ginger powder, whole carom seeds, turmeric powder, fenugreek seeds, asafetida all aids in improving stomach digestion power and reduce the gastrointestinal problems. 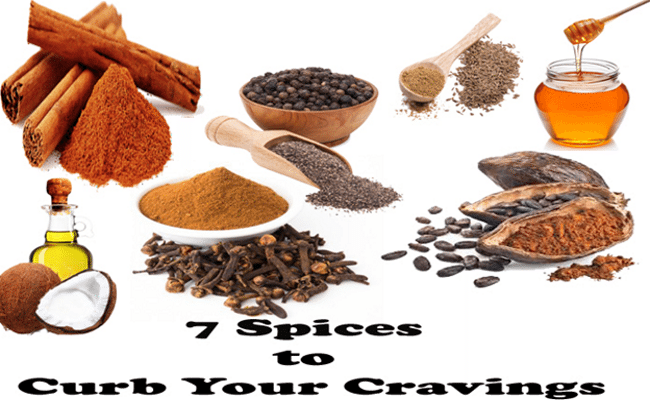 Here are the seven most important spices to curb your cravings. Boring food can be exotic and flavorful adding these special spices. Cinnamon is used in soups, cakes, black coffee and oatmeal. Cinnamon is a key ingredient for regulating blood sugar level in the body. It also promotes insulin in the body. It restricts the bacterial growth in the body. It is a good anti-clotting agent, which is helpful in reducing heart stroke and heart problems. Moreover it is good agent for inhibiting the cancer cell growth and avoids occurring cases of Leukemia and Lymphoma. It has a good and extra ordinary sweet taste used to garnish the desserts. It is best used in making biriyani and hot spicy food. A clove is good for regulating blood sugar and to reduce craving. A whole clove is used as a best mouth freshener to remove the bad smell from mouth. A pure and herbal soothing agent used to treat the sore throat taken with dry ginger. It is the best alternate of sugar; it lowers the cholesterol, used for weight loss mostly. It promotes better blood sugar control. It has a good immunity booster effects. It is a best anti ageing agent used to repair the skin and healing wounds. Coconut oil is known for its spectacular benefits. Coconut helps is improving metabolism, aids in promoting healthy thyroid function. It is a good source of energizing the body. It also aids in controlling the blood sugar level and also good at secretion of insulin. It has a good anti bacterial, anti-fungal, anti-oxidant properties, antimicrobial properties used to fight against disease. Coconut oil is also good for improving skin and removing hair fall problems. Mostly Keralian people use this oil to make a fish curry for enhancing the taste of dishes. It smells really nice when cumin seeds pop in the oil. Cumin is used both as a whole and as a ground powder. Mostly in salads, soups cumin powder is sprinkled to improve the digestive function. Anyone from child to adult following gastric problem, whole or powdered cumin seeds helps to remove that gastric irritation. Cumin is regularly used in vegetables and dals of Indian cuisine. And especially in Biriyani and Pulav this is used to spread the special aroma. Cumin seeds powder also used to make a digestive drink called “Jaljeera”. This drink is popular in India to remove the acidity and gastric problems. Cracked or whole black pepper is used to add spice to vegetables and salads. It is used to improve the metabolism. Mostly in soups, salads and Italian food this is a favorite spice to add. It also acts as a best immunity booster and also used as an antibacterial agent. Whole black pepper is also aids in regulating menstrual disorders. It is also a good source of removing cough and cold when making herbal tea. Cocoa bean is the favorite ingredient of children and adults. It is not so sweet but still it tastes good. Cocoa beans helps in reducing cholesterol level. It also helps in improving appetite. It is full with Magnesium, potassium, iron which leads to raise happy brain neurotransmitters. It is a potent antioxidant used to weight loss when eaten without sugar. With simple tweaks you can improve your health. Here are the tricks you can follow and get the best health you always searching for. If you are addicted to sweets, use fresh fruits as a natural sweet, instead of using artificial sweetener like white sugar. It will satisfy your need of consuming sweets. Go frozen instead of canned. Avoid canned food if frozen food is available. Frozen food is rich in flavor and tastes good than canned. Canned foods are mostly added preservatives which are somehow not good for health. Thyme, cardamom, oregano, ginger, garlic, turmeric, coriander powder, mango powder, cumin powder all are the important herbs just not adds spice into food but also aids in improving digestion. So use herbs to season the food. 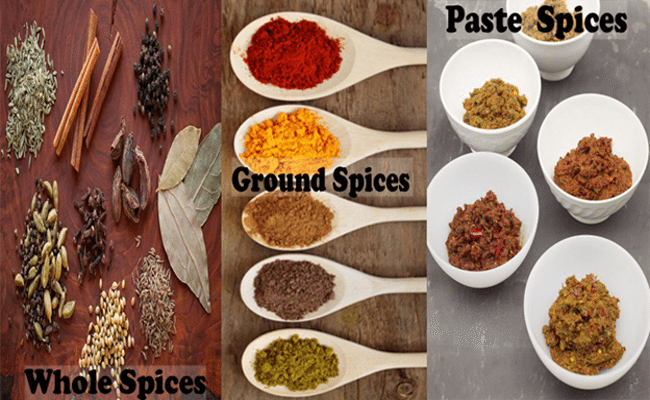 There are loads of benefits available in Indian spices. If you really want to buy Indian grocery online USA, you will definitely get it right from here. Here we have introduced all types of important information about how spices are helpful in improving health. It is a best and natural way to improve the metabolism and gets you the healthy body in the eco friendly way. I am Nupur Shah from Desi911. I would like to share my experience and ideas to make innovative, tasty and new Indian dishes for parties and all occasions. she holds relevant industry experience and writes about Recipes, Cooking Tips and Food-Beverages.